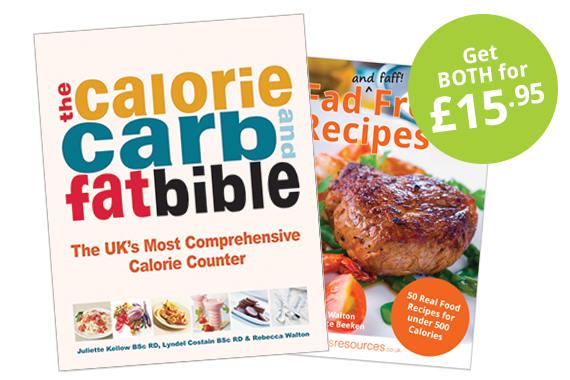 We've combined our best selling Calorie Carb and Fat Bible with our new Fad Free Recipes book to give you a great money saving offer. An absolute 'must have' to help you lose weight, the Calorie Carb & Fat Bible gives calories, protein, carbs, fat and fibre in over 22,000 foods - including an eating out section. Values are given for popular serving sizes and per 100g making it easy to compare different foods. If you're tired of the usual faff and fuss of celebrity recipe books, then you'll love our Fad (and faff!) Free Recipes - 50 Real Food Recipes for Under 500 Calories. Just cook, serve and enjoy!